The large compact active PM0.5d is Fostex's top-end nearfield monitor in their respected PMD-Series and is primarily designed for use with desktop PC or Mac based audio workstations when editing and processing audio in post production. Driven by a new high efficiency 35w (LF) and 23w (HF) high efficiency digital amplifier (one in each speaker) and with Fostex's latest 5" woofer and 3/4" silk-dome tweeter drivers, this attractive bookshelf-sized speaker is an impressive sounding monitor system at surprisingly modest cost. 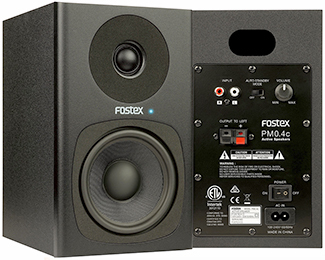 The medium compact PM0.4c is Fostex's mid-sized nearfield monitor in their respected PMD-Series and is primarily designed for use with laptop PC or Mac audio workstations when editing and processing audio in post production. Driven by a new high efficiency 30w (LF) and 30w (HF) high efficiency digital amplifier (one in each speaker) and with Fostex's latest 4" woofer and 3/4" silk-dome tweeter drivers, this attractive bookshelf-sized speaker is an impressive sounding monitor system at surprisingly modest cost. Constructed from quality materials and with a professional quality matt finish to the front baffle, the PM0.4c is available in a choice of Black or White finish. 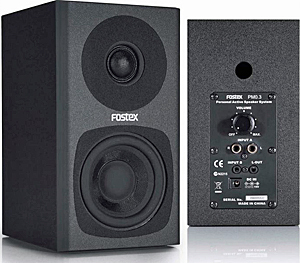 These desktop compact PM0.3d speakers are Fostex's small portable nearfield monitors in their respected PMD-Series. They are intended for occasional setups with laptop PC or Mac audio workstations when editing and processing audio on location. Or even simply as conveniently sized office PC speakers. 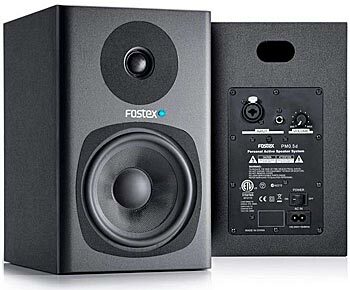 Driven by new high efficiency 15w (LF) and 15w (HF) high efficiency digital amplifier (one in the RH Speaker) and with Fostex's latest 3" woofer and 3/4" silk-dome tweeter drivers, these attractive desktop speakers pack a punch that belies their small size. Constructed from quality materials and with a professional quality matt finish to the front baffle, the PM0.3d is available in a choice of Black or White finish. 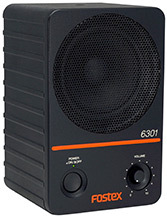 The Industry Standard Fostex 6301 Series is now the 6301N Series (N for New). Because it has recently been updated with a new in-built 20 watt amplifier, doubling the power of its predecessor, to match its new, improved 10cm full range driver to deliver an even bigger punchier sound, full of clarity from such a small, versatile monitor. Best used in pairs, they accept any line level input, so they are ideal for use with instruments in project studios, on stage, in remote recording vehicles, video productions & multimedia presentations. A very versatile speaker indeed, and now even better than ever. Manufactured from cast aluminium, these great little monitors have earned a high reputation among production, broadcast & presentation professionals for being rugged & road worthy. Four versions of the 6301N are available: the 6301NB with its 1/4" Jack input, the 6301NX with its choice of 1/4" Jack or XLR inputs, the 6301NE which is an electrically balance version, and the digital 6301ND with its choice of AES/EBU XLR input or analogue 1/4" Jack input. 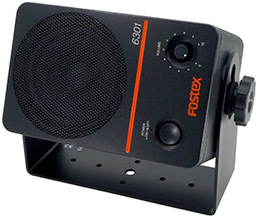 The optional Fostex EB6301 vertical/horizontal bracket (shown above) enables any version of the 6301N to be permanently installed.